I am not a thug, I am a vital part of a team that helps Russell Simmons run his multi-million dollar businesses. But in a dark alley, I am the reason ladies clutch their purse. I started crying right there. 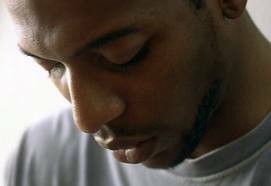 My heart filled with guilt as I couldn't help but feel I have in some way propelled the stereotypes that plague black men. I've learned to live with those stereotypes. We quickly learn that our dreams ain't what it seems. All black men know these streets are not safe for us. We know that we might end up on the wrong side of a cop's bullet for pulling out our wallets. We know that seeing a cop doesn't make us feel protected or safe, but instead, fear for our lives. Since I was a young boy, that is how I learned to live. And unless things change I'll raise my sons the same way. At any moment, a young black male can end up like Trayvon Martin. I embraced the hip-hop culture. I remember wearing my headphones on the train singing rap lyrics from Wu-Tang, Biggie, and others. I was expressing the struggles of what blacks have to go through in America. But to others, I was just a rowdy urban youth, up to no good, in desperate need of a belt. Hip-hop captures those emotions we felt better than anything, but instead of identifying it as giving voice to our cries for help, they dubbed it gangsta rap. I was born in the projects, the hand I was dealt wasn't a great one. My father was an abusive alcoholic, and my mother a high school drop out. Add in the fact that God popped me on the Earth dead smack in the middle of the crack era, it's safe to say I grew up in a war zone. In the hood we are told many things, which were outlined in Aloe Blacc's song "Life Is So Hard:"
and the list goes on and on and on and on...."
I must let you know that in the slums of America you have no choice but to look suspicious. Because if you don't, you get robbed, picked on, or worse: accused of acting white. I suffered those allegations. While my baggy jeans showed off my lack of fashion sense, I headed to my gifted and talented school every day and excelled. Excelled around a group of white kids who ridiculed me every single day. They thought and assumed I was something I was not. Poor project trash who didn't belong. I wonder what George Zimmerman would think of me if he saw me in his neighborhood. I wonder if I would make it out. Trayvon didn't have to die! Not for that, not for going to get a pack of Skittles. It's time for a change! We must stop feeding these stereotypes by killing each other, and not by accusing our brothers and sisters of "acting white." At the same time, white America needs to understand that our clothes and music do not define us. We are fathers, brothers and sons who want to experience the American dream as well. Right now it's just a nightmare. After reading this, how do you feel? What steps can we take as a collective community to prevent future tragedies like this? As a culture have we let stereotypes assigned to us, define our futures?